This classic inSpirit title is currently available as an eBook in the Amazon Kindle Store. The 1993 inSpirit title. The inSpirit Series was previously known as the Meditation Manual Series. Here are 40 meditations that span the seasonal flow of life, finding moments of truth in an Arizona sunrise and falling leaves, in the expectations of Father's Day, and in the silence of a still river. 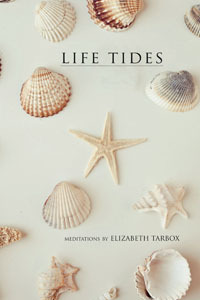 Life Tides invites the reader to pause and listen for the voice of the spirit, whether it's at the ocean or in daily connections with other people. The bay at high tide is an invitation. It calls and I follow, falling into the chill wet blanket of motion and mystery. “Put down your face and stretch out,” it sighs. “Relax, the element is friendly. Swim out to the raft and fill up your ears; hear the throb of the ocean massaging the land. Experience the momentary panic of salt water in your nose and mouth; go on, it’s here for you.” The bay at high tide is a sparkle of fiberglass and a slapping of halyards; it’s a rolling, relentless sucking at the shore and uneasy toeholds on the backs of unseen sea creatures. But at low tide the sand is strewn with the waves’ forgotten favors. I stand, abandoned like one of the empty shells, staring out beyond the horizon where the water receded, where I cannot follow. Low tide is for reflection and acceptance. I do not belong to this water world after all. I long to wriggle into the muddy sand and shoot out tiny fountains like the clams, but I cannot. I can only stare into the pools from the salt-spray-softened surface of the beached raft and let memories bathe me. There is a time for high tide—being involved and active, taking risks, and putting out effort to master the elements—and there is a time for low tide—inactivity and quiet reflection—and both are necessary in our lives. May this be a low-tide time for you, when you can hear the voice of your own calming and thought-ful inspiration, a time when thoughts come uncalled for to comfort or challenge you; and may you go from here renewed and ready to answer the call of your destiny, to jump back into the tide of life once more.